"Israeli security chiefs speak out with rare openness. Mesmerizing!" The Columbia Review. Having written several novels involving the Israeli secret services, I found “The Gatekeepers” irresistibly interesting as it contains interviews with key Israeli spy figures. However, while this movie purports to be a documentary, its clever editing, designed to support its heavy-handed political theme, makes it less faithful to historic facts than many novels. 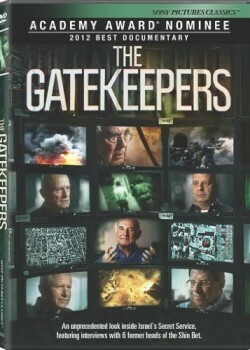 The Gatekeepers is a documentary consisting mostly of short clips from long interviews with six former chiefs of the Israeli domestic security agency (“Shin Bet”) (the equivalent to the FBI in the United States). In between, there are short snippets of video footage, mixing real historic material with dramatized clips of unexplained origin. In its essence, The Gatekeepers is a well-done yet lengthy political ad for the position that Israel’s “occupation” of the West Bank and Gaza is the reason for lack of peace in the Middle East. Many of the interview clips seem to have been cut by the movie editor and taken out of context in order to support this central political theme. Current events don’t help this theory either: Israel has long ago handed over Gaza and most of the West Bank to the Palestinians, who not only have continued to fight Israel, but have since commenced a lengthy war with each other, pitting Hamas against Fatah in a sad mirror of the wider, tragic conflicts between secularists and Islamists, as well as Sunni and Shia believers. Furthermore, the constant state of war in the greater Middle East, currently flaring up in Libya, Sudan, Iraq, Syria, Lebanon and Egypt, also proves the irrelevance of this minor “occupation” to the greater Mideast perpetual state of war.